Today they let the D23 line in way before 9am to line up inside for the areas you wanted to go right at 9am. The first level was very crowded with people wanting to go to the Arena, so we decided to go up to the Treasure exhibit first. We ended up getting in the Treasure Trove store line first, since yesterday the lines for the stores got bad quickly. Inside the Treasure Trove store there was plenty of room to navigate and it was also pleasantly not very crowded because very few cam up to the Treasures area first thing. 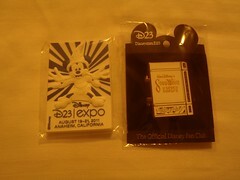 Mik ended up getting the Snow White Book pin and I got a D23 Expo magnet. The checkout queue was not bad because it was not very long, but it was set up barely wide enough to even turn Mik's wheelchair for the turns.